We shouldn’t under estimate the benefit of articulating our bodies. Every morning, in fact every time (the lazy beast that is) my cat gets up from his comfortable perch on the radiator bed, he stretches, that long languorous whole body stretch that cats do, weirdly similar (?!) to the yoga move ‘cat stretch’. I smile at him before I frown, thinking about my own lack of morning enthusiasm to stretch on waking. That was true until a client was telling me about how she had managed to change her ways. She was managing to stick to a daily morning ritual of yoga….a simple 10 minute routine. 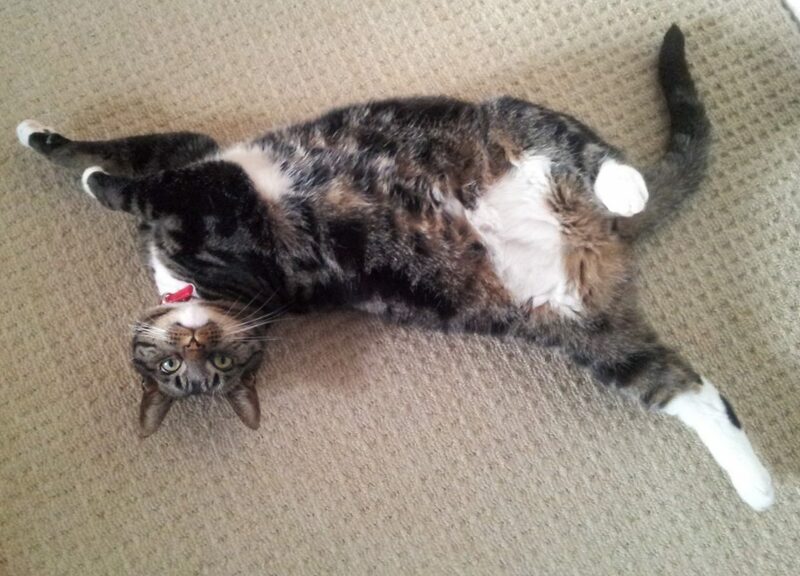 (Obviously I have been ignorant to my cats suggestive stretching for the last 6 years of his life). When I prescribe exercise and movement for clients, trust me when I say that I know how hard it is to make permanent change. Pain is a driver, once the pain is gone, the reminder ends. So, let this blog be a new prompt. We are now in March, let’s get our winter bodies moving again, ready for spring… or more sledging! How are we to achieve this new healthy vigour? With some stretching of course! 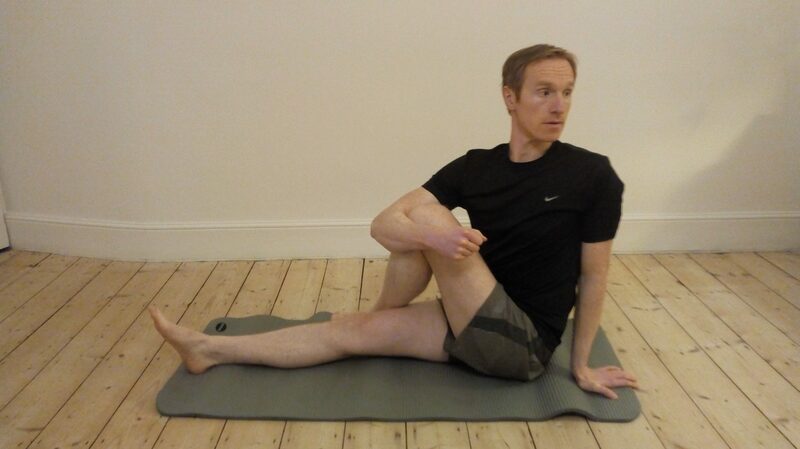 This blog is going to focus on the spinal twist…. The spinal twist (in all its variations) has to be one of the best all rounders for health. It’s benefits to the; digestive, musculoskeletal, eliminatory, psychological and cardiovascular system are bountiful. This image of zac shows a simple supine version. 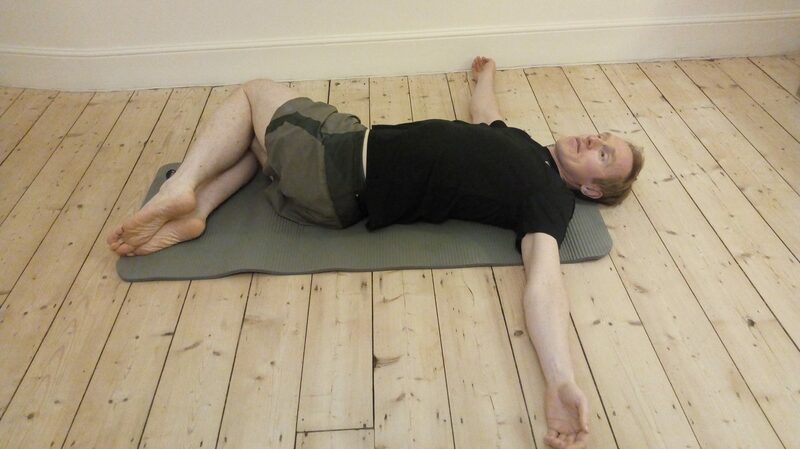 To perform this movement, start by lying flat on your back. Bend your knees up and plant your feet on the matt. Spread your arms out wide either side of you. Gently let your legs drop to one side while rotating your head the opposite way. Breathe slowly and fully for five breaths before twisting to the other side. In our daily activities we tend to work in straight lines, rarely into rotation….until we injure ourselves. Our inability to coordinate rotational movements between our shoulders, hips and spine may well be a factor why so many of us develop spinal problems. The spinal twist movement encourages flexibility, not just within our spine, but also through our hips, pelvis and shoulder girdle. The twist gently encourages the small postural muscles of our spine to lengthen and contract as we move from side to side. The movement of the torso with the shoulders and hips aids the coordination between these areas, as well as helping to relieve tension and improve circulation to the muscles. 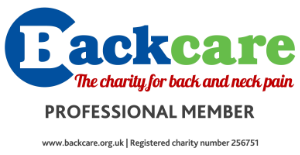 The improved range of movement and restoration of circulation helps to relieve low back pain. Now that’s got to be a good reason to start twisting! The rotational movement through the torso both squeezes and massages our digestive organs, helping waste products of digestion move down the system, as well as literally wringing out toxins from our organs, helping them to perform their functions better. Taking time out for ourselves to perform yoga is hugely beneficial to the mind. The slow movement of the twist, combined with the focus on breath, helps us concentrate on the here and now, rather than all the other jobs our mind is telling us we’ve got to do once we’ve stopped twisting! Here’s a seated version too. Make sure to keep both sit bones on the mat and not to twist your pelvis. If you experience pain attempting these poses, stop. Pain is a warning from the body that it is not happy.